When friends turn against you? Ed Balls’s sudden embrace of austerity and the public-sector pay squeeze represents a victory for discredited Blairism at the expense of the party’s core supporters. It also challenges the whole course Ed Miliband has set for the party, and perhaps his leadership itself. Unions in the public sector are bound to unite to oppose the real pay cuts for public-sector workers over the next year. When we do so, it seems we will now be fighting the Labour frontbench as well as the government. Read on……. Would you buy a used car from this bunch? The first time a Labour Leader chose his own Shadow Cabinet, rather than by election among the labour MPs themselves, we get an uninspiring Leader choosing a pretty uninspiring front bench! 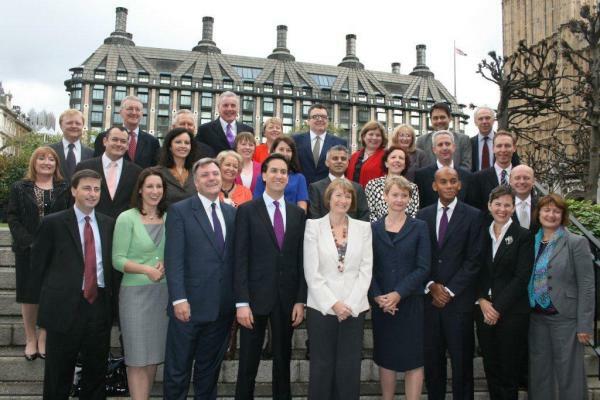 Most would struggle to identify more than a handful of Ed Milband’s pick for his A team. The new faces are simply time served party apparatchiks who have known little else but politics since leaving college! This is probably the weakest Shadow front bench we have ever seen and inspire little in the way of confidence just at the time when experience may be needed. Labour leave parliament with the disaster for Ed Miliband at PMQs still reverberating in their ears, a disaster for them on Europe, and if that were not bad enough, Labour is now firmly behind in the latest opinion polls! No sense of direction is apparent and Ed Miliband’s leadership is turning into a disaster in much the same way Michael Foots leadership was a huge mistake! Ed Balls, in his announcement before this years autumn conference that he no longer had ambitions to lead the party, was interpreted by most, as firing the starting pistol for the race to replace Ed Miliband as leader. At least, it was an open invitation for plotting to commence. Yvette Cooper, no wonder she has not taken her husbands name, it’s Balls! Is said to be in pole position and the favoured choice of those who judge these things, especially the MPs! She will have to assert her political independence though, if she is to remain front runner at the end. Many other political political careers, currently on hold, will depend on Yvette’s success. Why is John Healey not in the Shadow Cabinet? Is a question I have now heard many times. Was it the result of pure political spite on Ed Miliband’s part, as some have suggested for the support he gave Ed Balls? Whatever the reason, the Shadow Cabinet is the poorer without him! MP Expenses Scandal – Balls & Cooper, A Tory Complains! Yvette Cooper, shadow Home Secretary and her husband Ed Balls, shadow Chancellor, both Yorkshire MPs, are in further difficulty with their expenses claims. It has emerged that Andrew Bridgen, a Tory MP for North West Leicestershire, has written to John Lyon CB, the standards commissioner (AKA the sleaze buster, by some) complaining about the high number of claims made by the pair for family travel. The ‘Green Book’ allows an MP to be reimbursed for 30 journeys per child, per year. The couple claimed for 375 journeys taken by their three children between 2007 and 2010 between London and Yorkshire. This adds further to the recent embarrassment for the Yorkshire & Humberside Regional Labour Party after Eric Illsley, Elliot Morley and Denis MacShane! One by-election victory in Barnsley does not repair the damage to their reputation. They still have to face up to the fact that the expenses scandal is not going away any time soon and won’t, until the past is properly dealt with and the expenses fraudsters brought to book! Why are Cooper and Balls of interest to us? Yvette Cooper, threw her hat in the ring in 1996, for selection as Wentworth’s replacement Member of Parliament for Peter Hardy. John Healey won comfortably, Yvette polled just 14 Votes from a then membership of 900 plus. Oh dear! I did warn her! Her exceedingly poor performance in terms of votes was affected by an indiscretion at a Brampton Parish Hall Christmas do, a fortnight before the final selection meeting. Yvette’s husband to be, Ed Balls, put his foot in it when he was overheard to say, “This was his first visit to Yorkshire and he hoped it would be his last!” Not the best way to endear yourself to a bunch of Yorkshire folk wanting to find a suitable candidate to be their next MP!